A while back I foolishly ordered four manly colors of sock yarn from Knit Picks and started my first pair for Christmas knitting. 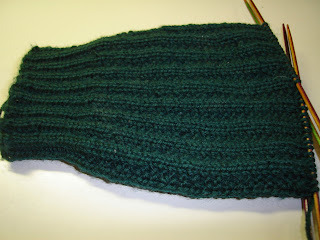 Here is a previously posted progress photo: This is the Sailor's Rib from the second Charlene Schurch sock book. It is a four row repeat, which is a little much for me given that this is only my third pair of socks. It is also my first and last attempt at a toe first sock. This is due to hatred of the toe up method. It is knit on a size 2.25 mm needle at a gauge of 8 stitches per inch. Anne had noted that it looked a little narrow for her father's (my husband's) foot. I scoffed at this, explaining that it was a rib and would stretch. But as I continued to knit, her observation began to trouble me. I finished the sock and encountered the dreaded toe up cast off which I had been warned of by Wool Enough, or as I like to think of her, Woolie. Woolie was right; it was a nightmare that had to be repeated three or four times before the cuff was stretchy enough to pull over the human foot. I cast on for the second sock. I cast on 60 stitches, as I had for the first sock. Note the italics. I was knitting an 8 inch wide sock when I needed at least 9 inches. But it wasn't until I got to the heel of the second sock that this dawned on me. I had been looking at the wrong row of the Schurch chart. I really wanted a 72 stitch sock. By now I was so disgusted that I was happy to frog the socks. This took all night due to the weird cast off (details of which I have blocked from memory) and the short row heel wraps. I don't know where I found the courage, but I choose a simpler rib (Garter Rib) and cast on again, correctly this time. Here is the result so far: But there is more. I saw a tip on Ravelry to knit both socks at once. The tipster said that every time she sits down to knit she works on the sock that has the least knitting on it. She says that both get done at roughly the same time. Great idea. I had subliminally noted that Abby of the Bitten by Knittin' blog does the same thing. 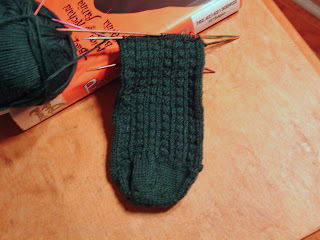 For now, I'm slogging along on one sock at a time, but my order is in for a second set of Knit Picks sock needles. I guess these socks will be a Valentine's Day present. 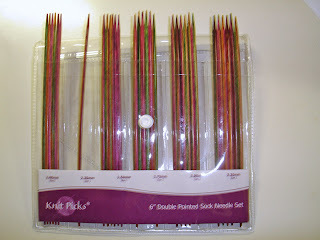 I too adore Knitpicks Harmony needles. I treated myself to the set of circs with separate cables and tips a while back, and they are wonderful. Alas, my collection of bamboo sock needles is too huge to justify replacing them with Harmonies. Interesting that your Harmony DPN's knit tighter than bamboo; kinda gives you a new range of needle sizes -- U.S. #1.25? And thanks for the nickname. I like it. Good idea about the nickname. I think I'll use it too. I can see the difference in needle sizes, but which one is the correct size for what it is labeled? I like my Crystal Palace dpns, but I admit my gauge on them has always seemed a bit loose. Hi. I'm sorry this looks like being aggravating, but I was searching for the Sailor's rib pattern for a friend (not a whole pattern, just the repeats for the sailor's rib), and can't find it anywhere online without having to buy a pattern. Could I possilbe get it from you? She and I would both thank you muchly :).